This was the fourth concert by Midge that I have seen. My first was on the Out Alone tour where there was just him, a guitar and a keyboard. Then Karen and I went to an art centre in South London and saw him during the Breathe tour. Now that was a superb gig. Listening to "A Glorious Noise", the recording of one of the Breathe concerts, brought back just how good a show it was. It rocked majorly. Then came the Rewind tour. Still quite good, but there was something lacking, possibly the sound wasn't quite right. 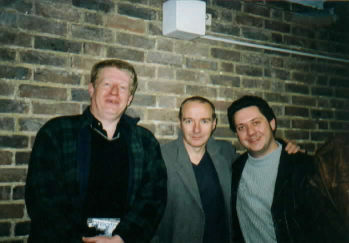 It was at this gig that I finally got to meet Midge, and very nice he was too. There is a photo of myself, Gavin and Andy from that meeting and Midge looks terrified, lol. He is squeezed between a short, podgy guy in a leather coat and a large, gap toothed, yobbish looking me. Oh and if you look carefully, you'll just see Andy's elbow peeking in from the right hand side. So, when I heard that the title of this tour was Sampled, Looped and Trigger Happy, I was intrigued. I mean, apart from a slightly changing play list and different bands, Midge's gigs tend to sound very similar to each other. Listen to the concert released on cd of his show on the BBC and compare to some of his more recent shows and you'll see what I mean. However, the Breathe stuff was excellent, as mentioned. One of the things that the Midge Ure website had done was to ask fans to vote for the tracks that Midge doesn't normally play. The Harlequin Theatre is actually rather small. So it seemed full, lol. I was rather chuffed to see this as it meant for a cosy atmosphere and hopefully a good boogie down the front. The support, John Young, was rather good. A strong voice and excellent keyboard skills added considerably to songs that seemed just a little too middle of the road to make any real impact. I would be interested to see how they would sound with his full band doing the backing. I think a band set of them would do them better justice, to be honest. A friendly chap, with his own fans in, he would chat between each of the five songs, letting the audience know what the following song was about and also a little of his pedigree which is impressive to say the least - he has worked with the Scorpions and Greenday to name just two. Then came His Nibs, (or The Boss, as he is known on the website). With just a two-piece band backing him, I was wondering, more and more, just what he had in store for us. So, on he walks with the band and immediately the opening notes of a very familiar Ultravox track started up. Yup. Finally, after all these years we were getting a true blast from the past.. Midge was having a couple of problems with his keyboard playing but it sounded nice - even if there was no Odyssey included. It was then that I realised just what the tour was about. I mean, yes, the title led to some guesses, but this worked, and worked well. With the use of some selected backing tracks to fill out the sound, suddenly things were rocking. Midge looked knackered - a fact he put down to having the previous day off from the tour and deciding to go play a couple of gigs in Poland! He still gave his all, though he did seem very tired. There was some of the more recent stuff played, Alone, Beneath A Spielberg Sky, Breathe, Move Me etc, but I did very much appreciate hearing some of the older stuff. I have loads of bootlegs of Ultravox and Midge solo concerts, (My favourite has to be the Plymouth 1981 concert). And one thing I always noticed was that the songs were played at a slightly faster tempo then the album tracks. Here, things were slowed down a little....and it helped. Passing Strangers, for instance. On the old Ultravox recordings, the instrumental break was never quite right, the sound wasn't full enough. No such problems here. A full sound augmented by guitar on the second half of the break and it sounded great. Edo was lovely....smooth, quiet and gentle. What I did like was that Midge used this sampled idea to do slightly different versions of old favourites. Fade To Grey normally just has the band treatment. Here, the old synth bass started up. Far more synthy. And so was Vienna. As on the Rewind tour, the first verse had the original drum line. Only after the first chorus does the new, Midge drum line kick in. But the instrumental break was very different. Oh, the tune was the same, but there was no guitar. All done on synth. You could feel my smile a mile away. Midge isn't known for keeping his opinions to himself on certain matters. And did he lay into Dubya and Blair, especially before Spielberg Sky, a song, we sadly are seeing come true. A word about the band. I have looked everywhere for their names, and I'm sorry, lads, but not even the official website has you listed. But you were great. Especially the drummer/keyboard player. Looking like a cross between Matt Lucas (George Doors from Shooting Stars), and Lex Luthor from Smallville, he looked like he was having a wonderful time. During All Stood Still, he left the drums and played the keyboard behind Midge. And proceeded to do the silliest dance which was superb. Asked about this afterwards, he apparently replied: " How can anyone not dance to such a great piece of music?". The sound was the best I've heard at a Midge gig, a fact I happily told Bernice Hardman, Midge's tour manager and front of house boss. I swear they had been ferried in from the local morgue. Dead was too lively a description for them. Oh, there were fans there, and there was certainly enough applause and whistles, but during the songs, they just sat there, staring blankly ahead. No one got up to dance. Such a shame. It was put down to the fact it was Tuesday, but I still say there's no excuse. This was Midge Ure playing at his best, rocking the house. How they could just sit there is beyond me, unless the Harlequin, frightened that too many people moving all at once might do damage to the building, had popped heavy doses of Valium into the drinks from the bar. That's the only explanation I could give for this. To sum up, an excellent concert, a novel idea that worked superbly. Midge hardly forgot a line and his voice was stronger then ever. Lots more, please and a little suggestion for the Midge website. Why not try to get a block of seats for the fans that can be booked through the site? That way we can all sit together and sod the rest of 'em. We can stand, we can cheer and lets face facts...we will come to dance. Sorry, lol, couldn't resist it. MORE..SOON...NEAR WHERE I LIVE....got it?